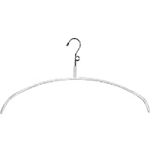 Home > Hangers > Salesman Hangers > Chrome 16" Lingerie Hangers with Loop Top. (box of 100). Chrome 16" Lingerie Hangers with Loop Top. (sold in box of 100). Sturdy unbreakable steel hanger contains two (2) cut-outs used to hang lingerie. May also be used for any type of lightweight garments with straps.